Let me introduce my floral print dress. She has been mine for a while, but she has not been introduced before, and she has actually not got very much attention from me either. I found her hanging around with a lot of buddies at the end of the summer sale. As there was so many of them, I did wonder if she and her friends were out of fashion or had some other problems. But, she spoke to me and when did I care about what is in fashion or not, and I decided to give her a new home. However, after I had brought her home we did not get along that well. Not that she is not pretty, but I was not sure that she made me shine. But this week I decided to give her a new chance, this time in an element that she from the beginning is not meant for – winter. I love when I find out ways to wear clothes that might not have the right cut for you (if I would have been a perfect style blogger, I would show you how the dress looks without a belt and cardigan on top, but I am a pretty lazy fashion blogger, and it was cold outside but maybe another time). And of course, I also love when I find out ways to wear summer clothes in winter, after all, you are reading a post at Four Seasons One Wardrobe! So from now, I and the dress is best buddies, and we gonna hang around a lot. My colleagues in the city at the big lake got to meet her twice this week, and next week I am going to introduce her to my other colleagues. The lonely days in the wardrobe is gone. And of course, I need to introduce my summer dress to all my friends over at Visible Monday at Not Dead Yet Style! If the pictures above is a little bite too dark, this picture is a little bite to light. That is what happens when your boyfriend is not a photographer. However, I am very thankful that he do help me with the photos. But given that my dear fashion blogger friend Tine from Highly Irregular Style think that these boots is lovely, I had to include a photo where the boots show too, despite a little too much light. 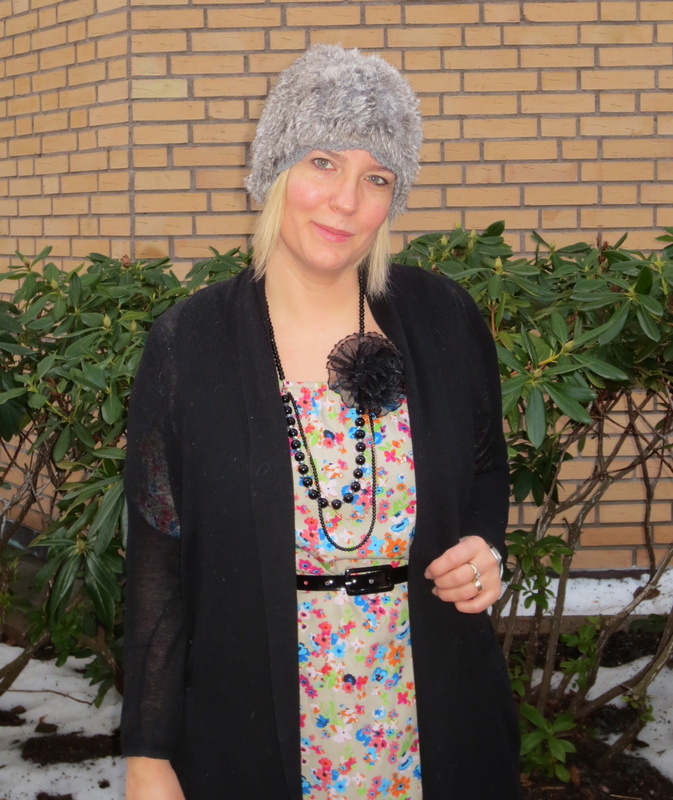 This entry was posted in How to wear a summer dress in the winter and tagged belted, black leather boots, dress, floral print, floral print dress, hat, necklace. Bookmark the permalink. She’s worth a second chance. 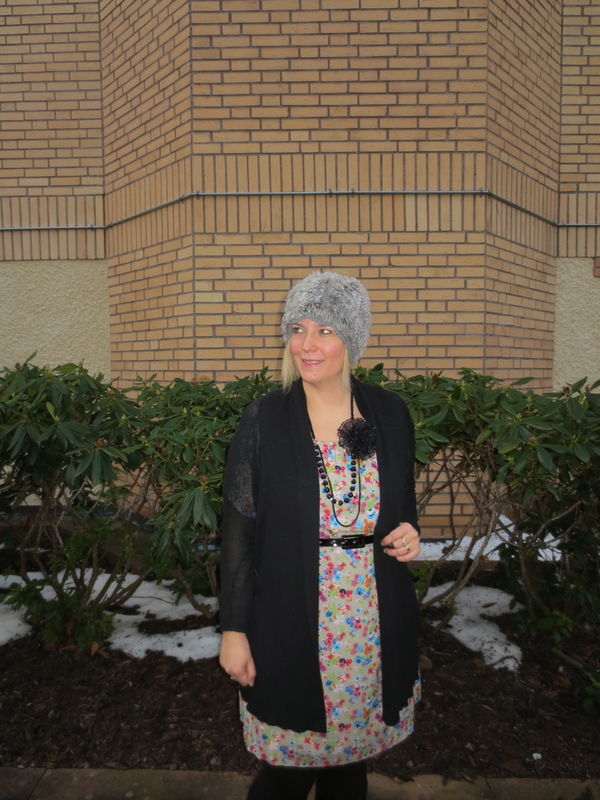 The floral print and the cheerful colors are perfect to brighten a cold grey winter day. It’s so good an idea to wear some summer clothes in winter. I can not imagine to wear warm cardigans, sweaters and trousers for 4 month, sometimes we need a reminder to spring. And a summer dress does that without any doubty. You look so great with this beautiful dress and that extraordinary cool hat. You are a perfect style blogger, let me tell you, nothing else. Adding so unique accessories to your outfits and being always an inspiration. PS: today I’m wearing my long slik tunique over a knitted dress, only because I don’t want to be winterly dressed. Hello my friend Sabine! If it would be enough to wear winter clothes only four months, I suppose we should be able to wear spring clothes soon. I wished! I suppose you get spring a little earlier than we do. I hope you soon will show us your summerly outfit on the blog! Thank you for your sweet comments, they made my day! Have a great week! Thank you – thank you – thank you! Your boots are really the best, and so great with this outfit! Your summer dress is now a winter dress, and I bet it’ll soon be a spring dress too. I do love your hat, it’s adorable with your beautiful face! The necklace is gorgeous too – I’ve never seen it on the blog before? Has it also been living the lonely life on some shelf? Scandinavian fashion magazine’s agenda. Of course that would be a hint to the reader’s that they don’t need to buy so much, but in these times of economical crises it would really serve a purpose, not to mention the reduced impact on pollution, another worthy course! but it might have been before you started to follow me, it feel like a long time ago! So maybe the necklace has not been treated as good that it deserves! Thank you and welcome Elly! As I said over at your blog, count me in as a regular follower! Yes, it would not be particularly good value for the money if we only wore our summer clothes during the short and sometimes absent summer. Thank you Katie for the compliment, they warmed my heart now when we have got 10-20 centimeter more snow! Thank you Patti, I am not sure if the dress is pretty without a cardigan, but we will se when it finally becomes spring! Thank you, it is kind of you to drop by too! Love your floral dress and your hat is adorable. I really like the hat! I feel like you only see those in magazines! Thank you Tallia, it is my favorite hat I am always afraid of losing it! Oh I think that dress is fab and I think it will be great to wear now and in the spring in so many different ways. I love the colors in it and how wonderful it looks on you. Thank you Debbie for your sweet compliments!